We are offering Silk Emulsion to our clients. No. 1 silk emulsion is specially designed interior emulsion paint to give smooth durable matt finish in a wide range of designer shades. Ensure the surface is dry and free from dust rust, grease, oil and loose matter. All surfaces should be thoroughly rubbed down using a suitable abrasive paper and there after wiped off. After proper surface preparation, apply a coat of suitable primer depending on the substrate. Allow it to dry for 6 - 8 hours. Smoothen the surface by filling dents with thin coat of putty and allow it to dry for 6- 8 hours. Sand the surface with emery paper 180 and wipe clean. Apply another coat of primer and allow drying for 6 - 8 hours. Sand the surface with emery paper 320 and wipe dean. Thin 1 litre of no. 1 silk emulsion with 500 ml of water. Apply 2 -3 coats of paint with an interval of 3 - 4 hours between the successive coats no. I silk emulsion can be applied with brush, spray or roller. Area of application :all kinds of plaster, concrete and a variety of other surface. We are offering Premium Emulsions to our clients. 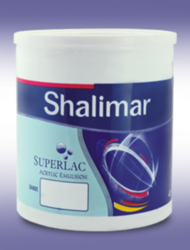 Shalimar extra is a premium exterior finish formulated with 100% pure acrylic emulsion. Its tough & durable film effectively withstands extreme tropical llfe of high rainfall, humidity, heat & cold, ensuring extra protection for exterior masonry, brickwork, rending & concrete. Its state of the art copolymer system is specially formulated with light-fast pigments and effective fungicides to keep exterior walls looking their best year after year. Remove dust, loose particle, chalk marks, grease, algae & fungi by wire brushing & wash with water jetting. Old painted surface should be sanded thoroughly. In case of newly constructed surface, a minimum of 3 months curing time is required before painting. Apply cement sand plaster to fill cracks & level surfaces. Do not apply putty. Stop water leakages and see pages completely. Give special attention to parapets & other horizontal surfaces, which are especially susceptible to fungi & algae. For surface already infected with algae and fungi, necessary surface treatment for removing the same must be adopted before painting. Thin 1 litre of paint with 400 ml of clean fresh water & apply 2 coats of paint. For newly plastered surfaces, do not apply cement primer. Use shalimar xtra as priming coat by thinning 1 litre of paint with 1 litre of clean fresh water or apply shalimar exterior acrylic primer. Apply 2 coats at an interval of 4 hrs minimum. On horizontal surfaces or parapets use 3 coats. Superlac Acrylic Emulsion is a specially created acrylic copolymer based emulsion. Its rich smooth mat finish will transform any room; and the look and feel of luxury will last for a year, besides its excellent flow and coverage, superlac acrylic emulsion dries real quick. Ensure the surface is dry and free from dust rust, grease, oil and lose matter. All surfaces should be thoroughly rubbed down using a suitable abrasive paper and thereafter wiped off. After proper surface preparation, apply a coat of suitable primer depending on the substrate. Allow it to dry for 6 - 8 hours. Smoothen the surface by filling dents with a thin coat of putty and allow it to dry for 6 - 8 hours. Sand the surface with emery paper 180 and wipe clean. Apply another coat of primer and allow drying for 6 - 8 hours. Sand the surface with emery paper 320 and wipe clean. Thin superlac acrylic emulsion with water in the ratio of 7:1 by volume. Apply 2 - 3 coats of paint with an interval of 3 - 4 hours between the successive coats. Superlac acrylic emulsion can be applied with brush, spray or roller. Premium Acrylic Distemper is a co-polymer emulsion based, smooth finish, fast drying, and quick re-coatable distemper paint with dean blight shades. Ensure the surtax is dry and free from rust, grease, oil and loose matter. All surfaces should be thoroughly rubbed down using a suitable abrasive paper and there after wiped off. After proper surface preparation, apply a coat of suitable primer depending on the substrate. Allow it to dry for 6 - 8 hours. smoothen the surface by filling dents with thin coat of putty and allow it to dry for 6 - 8 hours. Sand the surface with emery paper 180 and wipe dean. Apply another coat of primer and allow drying for 6 - 8 hours. Sand the surface 'with emery paper 320 and wipe clean. Dilute no. 1 premium acrylic distemper with water in the ratio of 100:70 by weight. Apply two or more coats of no. 1 premium acrylic distemper allowing an interval of 3 / 4 hours between subsequent coats muslin cloth for applying next coat. Looking for Shalimar Paints ?